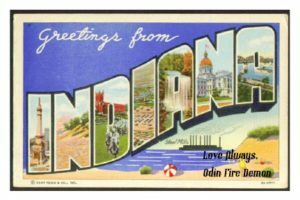 On episode 125, Harley and Brett have a most excellent adventure exploring Odon, Indiana. The Odon Fire Poltergeist is a most baffling mystery and the town of Odon has haunted by the tale since the 1940s. What could cause a house to catch fire over twenty times in a day in front of numerous witnesses? A G.D. Fire Poltergeist! How can you deal with a poltergeist? Do the movies have it right when it comes to ghosts? Want something a little darker? How about a cavernous canoe ride in the Bluespring Caverns? We cannot vouch for the cooking skills of the Odon Fire Poltergeist, but Smokin Jim’s BBQ knows what to do with the flames!